Originally from the Île de France, Chef Williams Caussimon holds a “Certificat d’Aptitude Professionnelle (CAP)” and a “Brevet d’Études Professionnelle (BEP)” in cuisine and a “Certificat d’Aptitude Professionnelle (CAP)” in pastry, confectionery, chocolate and ice cream making. He began his career in 1991 as first “commis de cuisine” at the Hilton hotel in Paris. In 1993, Chef Caussimon became “chef de partie” at the restaurant of the Raphael hotel. Over a period of more than 10 years, Chef Caussimon rapidly climbed the ladder: Initially as “second de cuisine” at the Auberge du Barrage in the Paris region, then as cuisine Chef at Guy Savoy’s Les Bouquinistes in Paris. His career as a cuisine Chef continued under Guy Savoy at the one Michelin-starred Club Chiberta. Guy Savoy then went on to employ him as Technical Director of Restaurant Guy Savoy in Paris where he worked from 2006 to 2010. It was at the end of 2010 that he became Restaurant Director of Un Dimanche à Paris, a concept store dedicated to chocolate. 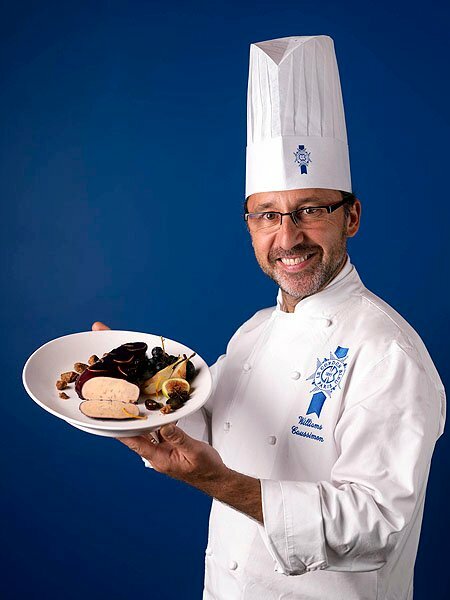 Chef Williams Caussimon joined Le Cordon Bleu Paris team of Chef Instructors in 2015.